Empty the deep fryer, it’s time for a road trip. Biodiesel is a clean burning alternative fuel. The simpler version of biodeisel is filtered vegetable oil. With a few simple modifications any diesel engine can be transformed to run on this cheap, environmentally friendly source. This is exactly what a couple A.P. Biology students are doing. 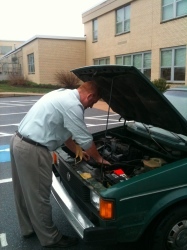 Erick Dutchess, a biology teacher at Penn Manor High School is taking the lead role in this story of ingenuity and cost-savings. Dutchess recently bought a 1984 Volkswagen Rabbit for $300. The Rabbit’s diesel engine already gets over 40 miles per gallon. 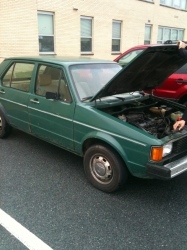 The 1984 Rabbit that will be converted. But diesel fuel can be 10-40 cents more expensive than regular gasoline, depending on where you live. Many drivers realize the increasing gas prices will soon take a toll on their wallets. “Gas prices are ridiculous,” said Ryan Wissler, a Penn Manor senior. Wissler sold the Rabbit to Dutchess, eager to see the transformations made to the diesel engine. “Greasecars.com gave us all the information we needed,” said Dutchess. Greasecars.com sent the bio class a DVD demonstrating how to change the engine. “Basically we use the core of the engine to heat the filtered vegetable oil to the desired temperature,” said Dutchess. The gas line is then shut off and the heated oil is delivered directly into the engine taking the place of the diesel. Dutchess said that there are no health concerns whatsoever with running the engine on vegetable oil. Having spent $2300 to get the Rabbit running, making a total of $2600 spent on the Rabbit, Dutchess plans to be breaking even within three years. Dutchess works on the engine of the Rabbit. “As long as there are no major mechanical issues, driving 8000 miles a year, I’ll be even in about three years,” Dutchess said. Filtered vegetable oil or biodiesel is a very good choice economicly for large truck companies that have trucks running for multiple hours a day. For this reason, many public schools as close as New Jersey are running entire bus companies on biodiesel. “Biodiesel offers the best option to increase our reliance on domestic, renewable fuels while producing significant results in terms of emission reduction,” said Joe Biluck, Director of Operations and Technology for Medford School District in New Jersey. “Biodiesel’s primary attraction is its ease of integration coupled with the fact it is a technology that is not capital intensive and can be applied to older units as well as today’s vehicles.” Interview found on Biodiesel.org. This may not be coming soon to Penn Manor School District, but Dutchess’ AP biology class can’t wait to get started. “There’s no downside besides the need to have a constant supply of vegetable oil,” said Maeve Snyder, one of the students working on the Rabbit. The class plans to get their vegetable oil from the high school cafeteria for free. This is an option open to any student driving a diesel engine, just see Dutchess for details. I think that Biodiesel fuel is going to be one of the most controversial subjects worldwide over the next 10-15 years. It is certainly going to help decrease our dependence on oil, at least a little bit. At the same time though, as people shift so much of their crops toward producing biofuels, that means that less and less food is available for people to eat — not a big deal for those who have the money to pay more for food, but for the billions who are already on the brink of starvation, shifting too much to Biofuels could literally kill them, all in the name of being green and saving a few nickels at the pump. This would be an interesting story to see on Penn Points.